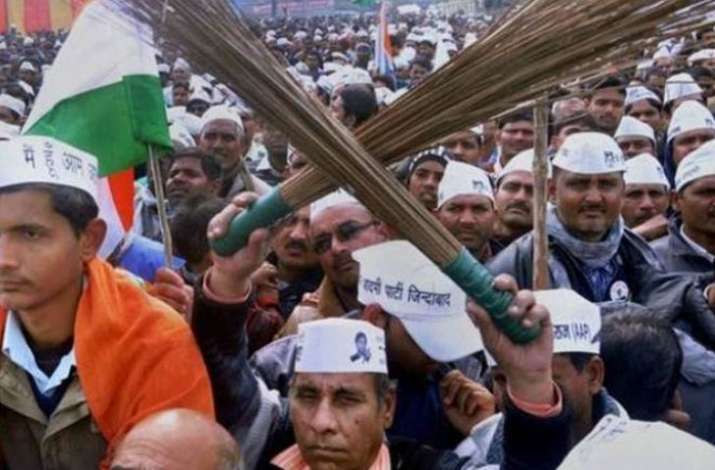 The AAP had won four out of the total 13 seats during the 2014 Lok Sabha elections. The Aam Aadmi Party Tuesday announced names of five candidates in Punjab for the 2019 Lok Sabha elections, with dissident leader of the party Sukhpal Singh Khaira expressing "surprise" over the decision. The announcements were made by party's core committee chairman Budh Ram, who was accompanied by party's chief spokesperson for Punjab unit Baljinder Kaur here. The decision by the AAP is likely to adversely affect the peace talks with rebel group. Khaira, who is leading eight dissident AAP MLAs, expressed "surprise" over the party's move and said the doors for unity talks were still open from his side. Addressing media here, Ram said sitting MPs Bhagwant Mann and Sadhu Singh will contest from their respective constituencies, Sangrur and Faridkot. Mann, a popular face of the party in Punjab and Sadhu Singh, had won their respective seats with a big margin of 2.11 lakh votes and 1.72 lakh votes respectively during the 2014 Lok Sabha elections, Ram said. Ravjot Singh, who had contested the 2017 Assembly polls from Sham Chaurasi seat, will contest from Hoshiarpur (reserve) seat. Singh, who is party's zonal incharge of Doaba region, had managed to garner over 42,000 votes during last assembly polls. Party's Majha zonal incharge Kuldip Singh Dhaliwal will contest from Amritsar seat and Narinder Singh Shergill, who had contested the 2017 Punjab Assembly polls from Mohali, has been given a ticket from Anandpur Sahib seat. Ram said the names of candidates for the remaining eight seats will be announced later. Talking to media, AAP MLA and chief spokesperson Baljinder Kaur said the election campaign of party candidates will be based on 'Arvind Kejriwal model' which worked successfully in Delhi. She claimed even as one year was left in the term of the Delhi government, the AAP government fulfilled all its poll promises. Kaur also criticised the BJP government at the Centre and the Congress-led government in Punjab for allegedly "failing" to honour their election promises, leaving people in lurch. Khaira said they had decided to extend their ultimatum by one week from November 1 in the interest of Punjab. "The way you are taking unilateral decisions, you are heading towards complete crash in Punjab and complete marginalisation of party. It is going to be very difficult to save the deposits even by star candidates on any seat," he claimed. "We are surprised over this announcement and they have pushed all the unity talks under the carpet. They behaved arrogantly," Khaira alleged. Earlier, the rebel group had given the other AAP MLAs an ultimatum till November 1 for scrapping of new appointments of district and constituency presidents before holding fresh round of dialogue to end infighting. Khaira said they had proposed to dissolve their ad hoc political affairs committee in order to take unity talks forward. "We are saddened with announcements of five candidates for Lok Sabha," he said. With this announcement, they have hinted that all the doors for unity are now closed, said Khaira. On the unity talks with Khaira group, AAP MLA Baljinder Kaur said, "We have always welcomed them. But the time requires that we need to announce Lok Sabha candidates." She rubbished the suggestions that rebel group was sidelined.